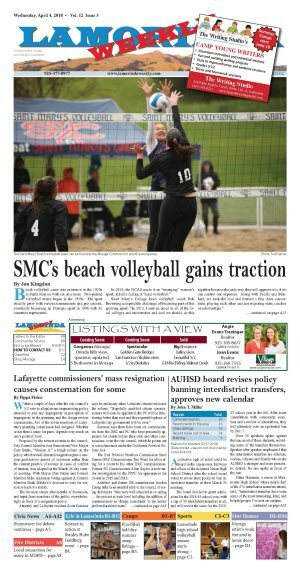 Within a couple of days after the city council's 3-2 vote to adopt an uncompromising policy intended to end any impropriety or perception of impropriety in the planning and the design review commissions, five of the seven members of Lafayette's planning commission had resigned. Whether or not that is cause for panic depends very much on one's point of view. Proposed by the newest recruits to the council, City Council Member Ivor Samson and Vice Mayor Cam Burks, "Version A," a tough reform on the policy which would demand resignation plus a one-year post-service period of exclusion rather than the current practice of recusal in cases of conflict of interest, was adopted at the March 26 city council meeting. With Mayor Don Tatzin and Council Member Mike Anderson voting against it, Council Member Mark Mitchell's decision to vote for version A made it a reality. The decision comes after months of discussion, and input from members of the public overwhelmingly in favor of a resignation policy. Attorney and Lafayette resident Scott Sommer says he and many other Lafayette citizens welcome the reform. "Hopefully qualified citizen commissioners will soon be appointed, the PC will be functioning better than ever and this regrettable phase of Lafayette city government will be over." Sommer says there have been six commissioners from the DRC and PC who have personally appeared for clients before their own and other commissions, even the city council, which he points out is a misdemeanor under the California Political Reform Act. The Fair Political Practices Commission fined former DRC Commissioner Tim Ward for advocating for a client to his other DRC commissioners. Former PC Commissioner Allen Sayles is now under investigation by the FPPC for appearances for clients in 2015 and 2016. Architect and former DR commissioner Gordon Chong talks in an emailed letter to the council, of seeing developers "who were well-schooled at co-opting ... the process at each level including the addition of commissioners as 'design consultants' to the initial/preferred architect team." Burks says that the decision marks a major shift in the way the council addresses issues of integrity. "I believe the new policy will tangibly strengthen public confidence in our design review and planning entities and processes," he said. Burks continues, "I considered this the most important vote that I've cast in my 15 months on the city council; integrity, ethics and public trust mean everything to me. Our community rightfully expects their government officials to execute at the highest standard when it comes to these critical values. In this context, I'm very pleased with the outcome." Reflecting the PC members' disappointment with the decision, the letters of resignation came quickly from Commissioners Ateljevich, Chastain, Curtin, Gutzwiller and Lovitt. "It is sad when a town's democratic body votes to disenfranchise a class of its citizens," says Chastain in his letter. "I am truly shocked that our leaders believe one is guilty before proven innocent," observes Curtin in her resignation letter. Tatzin is very clear in his opinion. "Obviously we made the wrong decision," he says, adding, "None of the current commissioners have done anything wrong. We've rejected five very good people whose only goal was to make this a better city." Both a former mayor and former PC member Erling Horn agrees. In an email to the council he states, "It is clear to me that the concerns outlined in these (resignation) letters are correct and the policy should be revisited. The city has lost a group of experienced, talented and dedicated citizen commissioners who will be very hard to replace." Former mayor Brandt Andersson referred to the policy as "punitive" at the meeting as he expressed doubt that anyone would want to sign up and serve on a commission under those circumstances. Getting people to serve will now be the new focus. To that end, Tatzin called a special city council meeting for April 2 to discuss how to move forward including options such as appointing the city council to do double duty and function as planning commissioners until new PC members are appointed, appointing the five existing DR commissioners to fill the empty seats or to temporarily reduce the size of the PC from seven to five commissioners. Burks is not panicking. "I'm 100 percent confident that we will be able to staff these commissions with fully qualified folks who will deliver a high level of service to our community," he says. 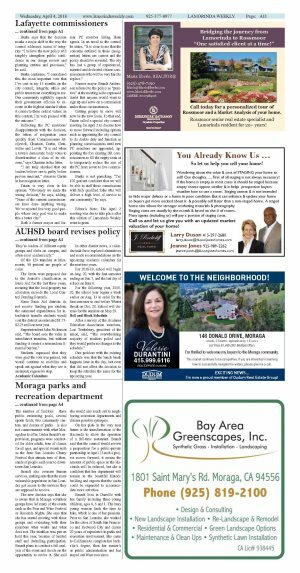 Editor's Note: The April 2 meeting was due to take place after this edition of Lamorinda Weekly went to print.